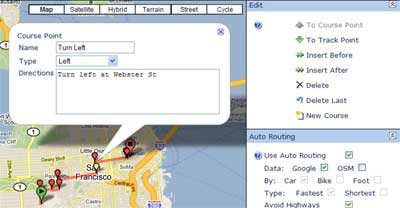 Bike Route Toaster is a bike routes creation tool using the Google Maps API. Creating a course with Bike Route Toaster is very easy. Simply zoom the map into the area where you want to create a course and click on your start point, way-points and destination. You can click the left mouse button to add a new point. Bike Route Toaster will then create your route, an elevation chart of the course and detailed directions. You can also upload a course to the site from a GPX/TCX file and registered users of the site can save their created routes. Hey check out our bike trails google map!It might be useful when u come over to Tuscany!